All bottles of Croatian wine with “Teran” on the label will be illegal to sell in the European Union from 1 July unless a row between Slovenia and Croatia is resolved. Slovenia’s agriculture minister, Dejan Zidan, has instigated a dispute over the red grape Teran by stating that neighbouring Croatia won’t legally be allowed to use the variety on bottles of wine sold within the EU when the country joins the organization in one month’s time. Slovenia, which joined the union in 2004, has had a Protected Designation of Origin for Teran grown on the red soils of the Karst limestone plateau since 2009, but the grape is grown on the same plateau over the border in Italy’s Friuli region, as well as on similar red soils in Croatia’s Istria. According to Nik Darlington, who sells Istrian Teran through his UK merchant called Red Squirrel Wine, Croatian Teran is currently being removed from the shelves of Slovenian wine shops. Describing the current situation as a “bugger’s muddle”, he stressed that Teran is called a variety of names, including Refosco, but happens to be called Teran in Italy and Slovenia, as well as Croatia. “I’m utterly baffled at Slovenia’s hawkish grandstanding – Istria’s winemakers have as much a right to call their grapes Teran than anyone else,” he said. Slovenia’s protective stance stems from the belief that its Teran is different, but Darlington said that DNA testing had proved that the grape is the same in Croatia. Furthermore, he recorded that Croatian vintners claim that variety is originally from Istria. Currently the Croatian agriculture minister Tihomir Jakovina is attempting to gain EU recognition for Teran across all its traditional growing regions, according to Darlington. However, should this fail, from the 1 July, all bottles of Croatian wine with Teran on the label will be illegal to sell in the EU, including within Croatia itself. 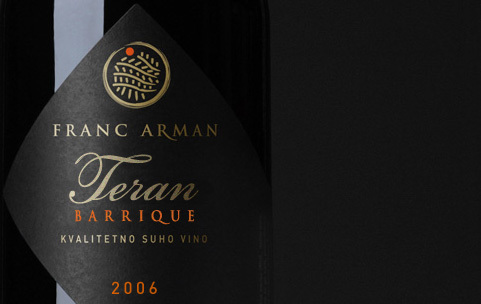 As retailer of Terrano from Carso in northern Italy as well as Teran from producer Franc Arman in Istria, Darlington will be affected by the dispute should no resolution be found. Having publicized the row in an e-alert to his customers on Friday, he told db this morning that he has now sold out of Teran, but that he would be getting more in, and wasn’t concerned about the situation. “Red Squirrel Wine certainly isn’t worried about threats at the EU, and nor I imagine are Croatian winemakers,” he said. “I believe the dispute will be sorted out in Croatia’s favour,” he added. According to Croatian website dalje.com, an association of Istrian winemakers called Vinistra has pressed the Croatian agriculture ministry to challenge Slovenia’s exclusive right to use Teran on the label. The red grape is rare on UK shelves, but both Red Squirrel Wine and importer and retailer Pacta Connect handle Croatian Teran, with the latter selling an example from Istrian producer Piquentum. Red Squirrel Wine however doesn’t import the Franc Arman Teran directly, and buys it through importer Croatian Fine Wines. The attempt to restrict use of Teran to one area reminds db of Italy’s successful protection of the grape Prosecco in the region around Valdobbiadene and Conegliano. And, coincidentally, Darlington noted that the European Court is also complaining about another Croatian wine. He said that a sweet wine from south of the country in Dalmatia called Prošek is being looked upon unfavourably by the EU as it’s felt that the name of this product is too similar to Prosecco – although there are no similarities with the sparkling wine. Darlington concluded that protected status should only be used as a “safeguard against substandard mimicry”. Click here to read more about Croatian wine following a Croatian wine tasting in September last year in London. Croatia is stilling the name of slovene wine Kraški teran which is produced from the grape refošk on special location in Slovenia and little part of italy. Croats “invented” grape teran to have the right to use the same name as slovenian wine which is produced from refošk. The lable Kraški teran is to be legaly protected after EU commision made a terrible mistake and was totally unjust to sloweinan wine producers.